The Engineering Building looks scary. Here's why. There’s one building on campus that doesn’t quite seem to fit in with its surroundings. Instead of being built with bricks, it resembles an impenetrable concrete fortress. It is, of course, the Engineering Building. Since its opening in 1976, the Engineering Building has been cloaked in a shroud of mystery. Students are often afraid to enter it for fear of getting lost. The building is home to Watson advising and most engineering classes (as well as other classes), but unless you need to go in for one of those, it’s best avoided. And over the years, rumors have arisen about the building’s origins. Some say the original plan was to build a parking garage in its location; others say the blueprints for our Engineering Building were mixed up with the University at Buffalo’s. This would mean that Buffalo has the real Binghamton University Engineering Building, while we have theirs (even though, until recently, Buffalo had four separate buildings associated with their engineering school). In reality, the building’s architectural design is based on a movement called brutalist architecture. Brutalist architecture, which sounds like it could be a class in the engineering curriculum, was a popular design style between the 1950s and 1970s. The term brutalism does not derive from the word “brutal,” but actually originates from a French term for “raw concrete.” This form of architecture is popular among governmental and institutional organizations, and spans the United States, Europe, Japan and Australia. 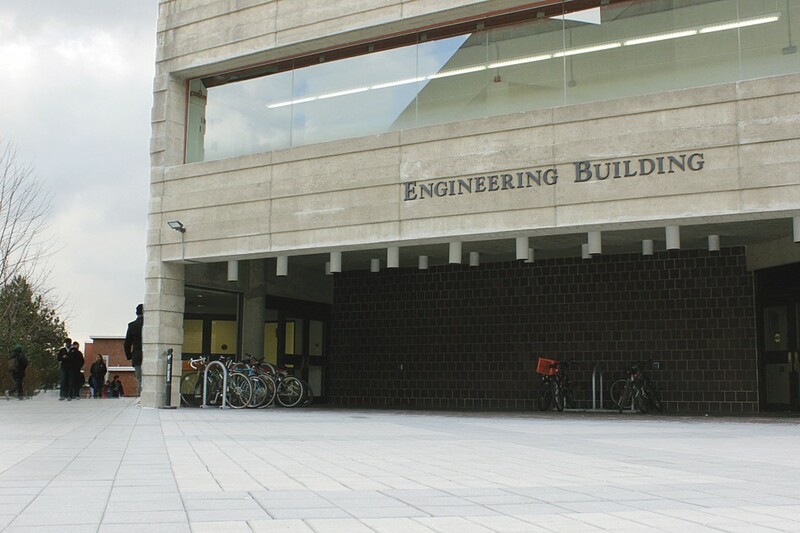 Karen Fennie, the communications specialist for the University’s Physical Facilities department, said that the Engineering Building was meant to be brutalist, and that the space is efficiently designed. Although the exterior design of the building reflects brutalist architecture, it’s the inside of the building that many students feel is brutal. With confusing hallways and bad directions inside the building, one wrong turn could be the difference between finding your classroom or finding the Minotaur. Josh Levine, a junior majoring in computer science, recalls getting lost frequently during his first year inside the Engineering Building. For many non-engineering students, the anomalous structure will just be something they pass on their way to class for four years. Rumors about the Engineering Building will always be a part of its history and will pass from year-to-year. Until better directions are placed or a tour guide is hired specifically for the Engineering Building, steer clear unless you’re looking for a “Goonies”-style adventure.